John Sculley, responsible for Steve Jobs' ousting from Apple in 1985, has recently said in an interview for CNBC that today's Apple is run very well, and that the company is actually going through a transition from once-a-year product launch cycle to a twice-a-year cycle. Interestingly, Sculley believes that once Apple completes the transition, it will be in the position to be incredibly successful (even more than now). According to the former Apple executive, investors and shareholders don't have a reason to be worried about Apple's general performance now that the company is run by Tim Cook, as design head Jony Ive is constantly introducing new ideas, so Apple hasn't really run out of creative potential. I think they're going through a very significant change now in terms of product cycles. Traditionally Apple introduces products once a year; now it's really introducing products twice a year. The complexity of that from a supply chain is immense, and Apple seems to be doing it well. So, I think that people are underestimating just how well Apple is run, and just how successful the company can be when it gets to that twice-a-year product introduction cycle. Translation: this guy still has a lot of stock he got for cheap when apple was accurately valued, and doesn't want to have that lose value. Blond older version of Mitt "Magical Undies" Romney? I think this guy was CEO when Apple's computers were a black screen with neon green lettering. Does he know what an iPod is? I got this from his statement. "Apple seems to be doing it well" So that would leave him with complete doubt actually. Choose your words carefully grasshopper. Notice the suit, tie and plastered Tim Cook smile. This guy has no clue. "...so Apple hasn't really run out of creative potential." Sorry John, I think Apple ran out of creative potential a LONG time ago! They have not changed the UI since the original iPhone launched where Android has come leaps and bounds in improvements! I find the irony uncanny. 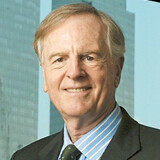 John Sculley is supporting Tim Cook's leadership only because he serves the same belief. The same belief that was running Apple six feet under under his leadership. Sure, he couldn't man the ship but is well equipped to receive stock options from a wealthy empire that Steve Job's had to rebuild from John's inept management ability. The very same things John mentions as good moves, are the exact opposite of what made Apple what it is while under Steve Jobs. John B. Twice a year product launches. This will be interesting. Does that mean 2 iPhones per year now? Considering the iPad had 2 launches this year ... it would not be a stretch. The Spring launch I imagine will just be incremental ... like die shrinks ... speed bump. The Fall will still be the larger screen, CPU, GPU, more cores, iOS, camera, etc. This guy is not working for Apple any more don't listen to him. LOL at his comment: Traditionally Apple introduces products once a year; now it's really introducing products twice a year. He honestly thinks that introducing more redundant products will make Apple great.